Got A Joke? Enter Pirate’s Booty’s “Cheesiest Joke In America” Contest! Pirate’s Booty has launched their newest treasure – Pirate’s Booty Mac And Cheese! Made with organic wheat pasta, real cheese and no artificial colors, flavors or preservatives – it’s a meal your crew members arrrgh sure to love. Pirate’s Booty is celebrating the Pirate’s Booty Mac And Cheese launch with the “Cheesiest Joke in America” Contest! So if you know of any “cheesy” joke, enter now for a chance to win a family trip for 4 to the Wisconsin Dells. There are daily prizes too! 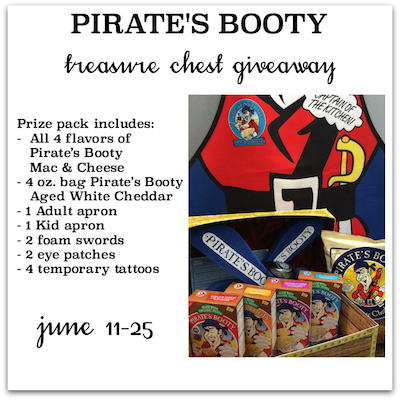 You can enter the contest by posting your cheesy joke on the Pirate’s Booty Facebook page, or by posting the joke on Twitter, Vine or Instagram, tagging @PiratesBooty with the hashtag #MacAndCheesyJoke. The submission period is from June 9 through July 14. Public voting period is from July 17 through July 24 where the top joke will be selected. Be sure to check out the Official Contest Rules for more info! Giveaway is open to US residents only. Ends June 25, 2014 at 11:59pm EST. Must be at least 18 years old to be eligible. Void where prohibited by law. No Purchase Necessary. To enter, use the GiveawayTools form below. Good luck! Angel Heaven Lee recently posted..Bling ALERT!! Well I just proved myself wrong. I thought that I would enter any contest! My favorite from when I was a kid is Knock knock, who’s there? Dwayne. Dwayne who? Dwayne the tub, I’m dwowning. I like stopping by to read the jokes. Some of them are so “cheesy”. I love it! What do you call a thousand lawyers chained at the bottom of the sea? A good start! Hi! Why did the cookie go to the hospital? Because he felt crummy. Thanks!! Q: How do you make a tissue dance ? A: Put a little boogie on it ! Do you have Prince Albert in the can? If you do, better let him out before he suffocates!